In June it felt as if the rain would never stop as we battled to complete this year’s breeding wader survey, dodging showers and driving vehicles across sodden marshland fields. The weather has hampered efforts to create ideal conditions for birds such as lapwing. A warm winter saw grass continue to grow and landowners struggle to create the short sward with tussocks that encourages birds to breed, This coupled with a cold early spring and rain late in the breeding season has meant that it has been a difficult year for wet grassland birds. Despite all of this, numbers of fledged birds were up on last year and it was fantastic to see that many farmers with breeding wader environmental stewardship options had taken on board the advice given during the autumn and that overall land was in better condition. A new North Kent Marshes Capital Grants Scheme, administered by Kent Wildlife Trust, is a welcome investment and should help farmers have better control of water and the opportunity to create new scrapes and rills which will encourage more birds to breed. The RSPB, who oversee this work in partnership with Natural England, are pleased with the progress that has been made so far and we all look forward to seeing numbers of fledged chicks increase next season. In June we were delighted to receive the news that the River Stour (Kent) Internal Drainage Board had voted to continued to work with Carol J Donaldson Associates and implement a plan of future work which we proposed to the board last year. This expanded programme will see us continue to survey drainage ditches across the catchment and advise on management but additionally will allow us to work with farmers to tackle problems such as diffuse pollution and soil run off as well as work alongside IDB staff to create a programme of enhancements to channels which will improve their value for wildlife and reduce flood risk. We will also be working closely with the Environment Agency on joint initiatives to manage and enhance main river channels. To begin this work we undertook a water vole survey on the Sarre Penn, a small channel near Chislet outside of Canterbury. Following new guidelines issued by Natural England for water vole displacement we will return to this channel later in the year to conduct a second survey before deciding on appropriate enhancements. water vole surveys are best conducted from within the channel. A Year in the life of an Environmental Consultant – March update. The month of March has been choca block full of water vole. Work to improve a pump house on a watercourse managed by the Lower Medway Internal Drainage Board involved widening a drainage ditch which survey work had revealed held a small population of water vole. Due to the length of the channel trapping was the only option. Working with Derek Gow Consultancy, traps were set along the channel and checked morning and evening for 15 days. After 5 days with no water vole signs the site was declared clear and the ditch banks were scraped of vegetation using a destructive bank technique overseen by ecologists. setting water vole traps on steep banks involves good balance! Legislation involving water voles has recently been reviewed. Where only small sections of bank are to be effected by works then displacement is sometime a better option than trapping. This involves strimming banks to bare earth in order to encourage voles to move to new territories. Until recently their was much uncertainty about the success of this technique and it was used widely and at varying times of years as a cheaper and less invasive option to trapping. Under Natural England’s new guidelines it will be necessary to hold a displacement licence to carry out this technique and work will only be able to take place during the early spring. The new guidelines provide welcome clarification for a practice which was previously open to interpretation and the emphasis on an overall conservation benefit from the work should hopefully make it harder for developers to destroy quality habitats and replace it with inadequate and overstocked translocation sites. More work needs to be done with follow up monitoring to ensure translocation does not result in a net loss of protected species. To ensure we are up to date with procedure we finished the month with staff training in water vole handling techniques at Wildwood in Kent. 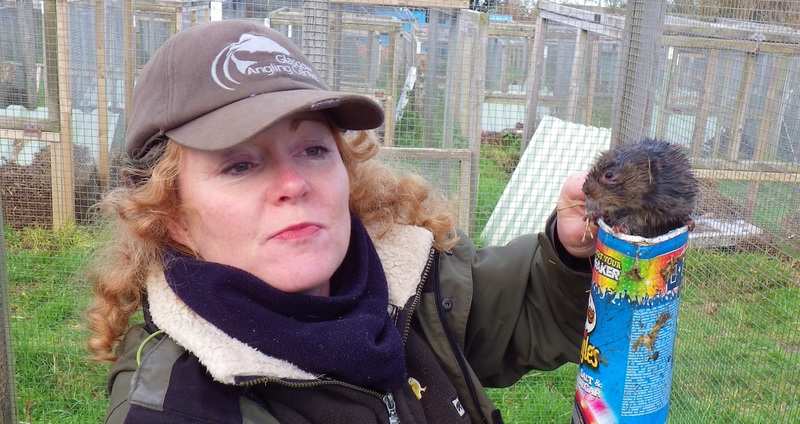 Meet Barry, the water vole, being held by Megan Philpot of the Derek Gow Consultancy. Barry was caught yesterday out at Great Bells on the Isle of Sheppey in Kent where I am spending plenty of time working for Medway Internal Drainage Board on a scheme to widen a drainage channel. 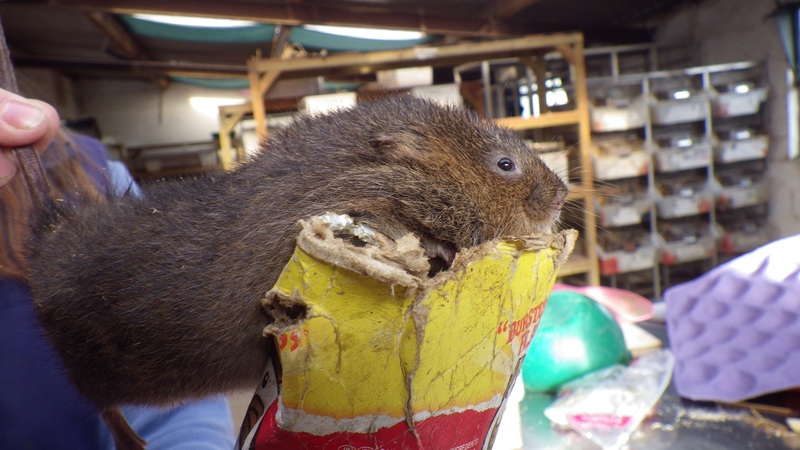 Unfortunately this means that the water voles need to be temporarily evicted so as not to be hurt by the machines. Barry is currently spending his days in a warm container fattening up on Golden Delicious apples before being released later this year. Water vole surveys do not normally take place in December but, with the weather in Kent staying in double figures, water voles were active all month. This allowed us to survey a section of Bells Drain for the Lower Medway Internal Drainage Board to see if water vole were present and look at options for displacing them when work takes place next year to widen this section of channel. Despite the unseasonably mild weather, wading in a channel on marshland close to the Swale Estuary, still proved bitterly cold as Matt Mordaunt, ecological assistant discovered. Raw winds battered across the grassland restoration site and we were grateful for the hospitality of the RSPB warden who provided hot cups of tea. Water vole were evident in low numbers along the channel and plans will now be drawn up to apply for a Natural England licence to move them, hopefully to a vacant channel on Sheppey. The rest of this month was busy with visits to farmers across the North Kent Marshes. Working for Natural England, we are sharing the results of this years breeding wader surveys with farmers receiving Higher Level Stewardship options and discussing the best ways to manage their land to encourage more lapwing and redshank to breed. We have been delighted with the positive and flexible attitude of all the landowners involved in this scheme and will continue to work with them throughout the coming year to get the mix of water and grass just right for these birds. Working with landowners is of vital importance if we are not to become a country where wildlife only survives on reserves. Much of our wildlife needs large spaces and interconnected habitats in order to maintain viable populations. Farmers get a poor press when it comes to wildlife and there is still plenty of room for improvement, particularly when it comes to chemical use, but many landowners are discretely doing some wonderful work for wildlife and take genuine joy in seeing creatures return to their land that they remember being abundant in their youth. participants in Medway Swale Estuary Partnership’s Soil and Water workshop. November began with attending a Soil and Water workshop organised by Medway and Swale Estuary Partnership. Working in ecology involves continuous learning as land use and farming practices change and this workshop gave startling figures on the costs to the farming industry of the loss of soil and chemicals into our waterways. This new knowledge was put to good use a few days later when we presented a review of six years of survey work to the River Stour (Kent) Internal Drainage Board Annual General Meeting. Members and staff praised the review which included suggestions for ways to continue the excellent commitment the board has shown to improving biodiversity into the future. peeling off the work area in layers. More work took place at Whitewall Drain a channel leading off of the River Medway. following the removal of vegetation and potential hibernacula for reptiles and a search for water vole, the site was stripped of vegetation in layers overseen by an ecologist. A dam was put in place to isolate the work site from the rest of the channel and fencing was erected to protect water vole burrows. Ovendens could then begin the work of installing new penstock structures, which will help control flooding. Investigations are also under way to fix a broken tidal flap, which is allowing tidal water to enter the freshwater channel. Infrastructure projects such as this always look raw to begin with but, once vegetated the structure will soon blend into the channel. During a follow up visit it appeared that the wildlife had already got used to the changes, as grey wagtails and kingfisher were spotted using the structure to hunt from. Spent the last week wrestling with water voles down in Devon on a course run by Derek Gow Consultancy to learn the right way to trap and handle these feisty rodents, which have seen there numbers plummet across Britain, mainly as a consequence of loss of wetland habitat and the ditches and riverbanks they inhabit, but also due to the introduction of American Mink who were released from fur farms and, unlike our native wildlife, could follow water voles into their burrows and through the water. Nowadays, water voles in Britain are protected by a myriad of laws which prevent their burrows being destroyed. This protection is a blessing but can sometimes cause problems when work needs to be done to improve rivers and ditches for other wildlife by narrowing channels, installing trees or creating new ponds. The solution is to temporarily catch the water voles while the work is taking place and then release them at a later date into a, hopefully, improved wetland. After a few days of mucking out water vole pens and learning the ins and outs of the law then Derek Gow proclaimed I had earnt my stripes and could be considered competent enough to go out and tackle the beasties in the field.